I believe this article gives a clear illustration of an important movement in the Church today. A great transformation in how we do church is under way. It seems that as a culture changes, God leads His people into new wineskins, if they are willing to go. The church that doesn't have fresh wineskins soon loses the wine! Today’s generation places high value on relationship and personal empowerment. The saints are looking for the ministry God has for them, and the centralized structure of the local church has not served this well. In fact, God means for every believer to be a minister and so He is moving ministry into the hands of every believer. A good way to understand the transition is to think of moving from a "Mainframe Computer" to a Computer Network". I remember seeing the mainframe computer at the University of Western Ontario when I was about ten. It occupied a room as large as a house. It was very large, very expensive, climate controlled, specialized, high maintenance, and compared to today’s PC's , very slow. The focus was on a few programs run by qualified operators in a safe controlled atmosphere. Sound familiar? Bill gates was the radical thinker who began the PC revolution. Today we are seeing a revolution in church wineskins not unlike the PC revolution. 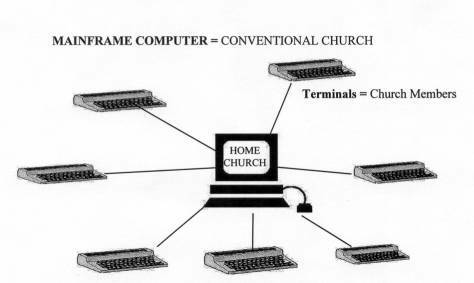 The "Mainframe Computer" model of Church. The form of tradition church is like a mainframe computer. Features - Large, expensive, operated by a few experts, focusing on a few tasks at a time, operates in one place in a highly controlled environment. Involvement - A few users (member) can have a dumb terminal (ministry), if one is available. They can only operate the program selected by the experts with supervision, after training .Focus - all focus is toward the mainframe. (church organization) It exists behind four walls. If it grows larger more terminals will be added, but there’s never enough for everyone. Applications tend to be specialized and not for the real world. The greatest vision of involvement is to be a programmer. The "Computer Network" model of Church. The emerging church is like a network of PC's. Features - Small, affordable, operated by anyone, flexible, mobile, and operates in any environment. Based in connections not a single organization. 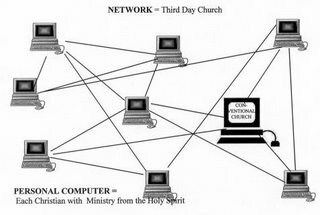 Involvement - Each person has a fully operational computer (ministry), with software that fits the personal situation (an anointing from the Holy Spirit). Freedom not control! Each one is connected to many others in a network of relationships that help each other. Focus - Mainframes are still there, but not in control. The focus is on the application operated by each one, not a central computer. We need, 'Wisdom for a Fresh Move of God by His Spirit Today. 'When we examine the history of revival movements and the outpourings of the Holy Spirit in Church History we see that God has poured out His Spirit and moved among His people continually in every generation since He began to pour out His Spirit on the day of Pentecost in the book of Acts. We can also see in scripture that God has supernaturally interacted with His people throughout history and that we have many examples in the scriptures both in the Old and New Testaments. The interactions of God with His people throughout scripture serve as both examples and wisdom for us as we seek to be apart of what God is doing in the earth today. I have had the privilege of experiencing the supernatural work of God among His people several times in my 36 years as a believer and know that every new supernatural outpouring of God's Spirit carries with it great blessings and challenges for those who are blessed to be a part of it. These notes are designed to provide Biblical truths that will allow us to chart a course during these times when the river of life runs both deep and often fast. A course that take us into greater growth and helps us to allow the deeper encounters with God to produce good fruit for His kingdom among the people we live around and minister to. Church history has examples of those who allowed the fresh outpouring of God's Spirit to grow His kingdom and them and those who were shipwrecked when an outpouring of His Spirit was mishandled and produced error and destruction. Since history tends to be written by the victors, those who were shipwrecked were often seen as heretics and the work God began in them is seen as error as well. We shall discuss some of these in latter articles. I have been ask by many to republish this article and so I have done so with several revisions. 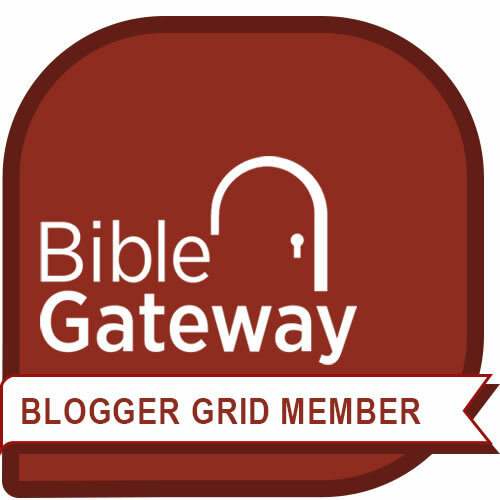 In response to an article that Pastor Glenn Buzby wrote had posted on his Blog and in conversations with other pastors and leaders in the Body of Christ it is obvious that many believe we must do a better job of making true disciples. Some have called for a new Reformation where the concept of the ministry or priesthood of all believers becomes a functional reality and not just a great idea. I believe that some churches are working very hard at this and are seeing some good results. I believe however, that many of our discipleship models are not based on the model Jesus used, which was the one used by Jewish Rabbis where people were equipped more completly and not simply lectured or had conceptual data transferred to them, which was more of a Greek model. When a Jew was taught something and said "I believe," they knew that their belief required a life that demonstrated that belief, it meant to live out the teaching and not simply give mental agreement that the concept or idea was true along with many others. Along with the 'hear and do model' came a relational model in which the rabbi or teacher developed a strong personal relationship with those he was teaching or in relationship with to in order to train them. This training was the passing on of not just a set of beliefs or ideas but of one's self and one's very life and purpose. The Bible teaches us that God will not rest on or abide with, or honor a people who do not know Him in an intimate way (one with a deep relationship), and who have lives that do not honor Him above all else. Upton goes on to ask that God's Glory and honor rest on our lives. This can only come as we yield to His Word and humble ourselves along with giving ourselves completely to Him daily. I am frequently amazed that my fellow leaders are seeking more and more complex and detailed ways to train people the wrong way,(using the wrong model). It is not the method alone but the content of our training and the relationship from which that content flows that needs change. The solution is not some amazing new way to teach people the principles of discipleship, but it is going back to what I have seen in students from all over the world. A total giving of ourselves to Jesus along with having a leader who will invest him or her self in the one being discipled. That is the starting point, which must be followed to truly equip others to completely become a true disciple of Jesus. The making of true disciples who have an intimate relationship with God is needed if we are to see a new Reformation of equipping people in Spirit, Soul (the mind, will, emotions) and Body. Equipping them to operate in today's world and market place, not as simple followers of a faith but of carriers of that faith even as the Ark of the Covenant was seen as carrying the presence of God. This is a functional realization of the doctrine of the Priesthood of all believers. It starts with what has been said above and then goes on to teach, integrate and experience the life and teachings of Jesus and His disciples today. Let us all give ourselves (our personal development), our discipleship and leadership training programs an evaluation. Are they accomplishing what Ephesians 4:11-13 intends them to? Are we developing people with a deep and vibrant relationship with and knowledge of Jesus? Will you ask God to start a new Reformation in you and through you, today? Accept the challenge and develop your relationship with Jesus today, so you can enjoy the adventure as you seek His plans and solutions for equipping other believers to become true disciples today. I remember the joy and excitement I felt as Dr. Gary McGee taught my New Testament Greek class at Central Bible College thirty-two years ago. I also remember him reminding us to keep using what we had learned so that we could remain ‘good students of God’s Word’ and that we might be able to help others understand the joy of discovering the beauty of wisdom and life God’s Word held for all who loved God. Over the years as I have studied, preached and taught God's Word I have rediscovered the joy, the richness and the flavor which I first began to experience in that Greek class, were renewed each time I explored the depth of meaning of God’s Word which is found in the original languages. Today the BibleWorks software has almost completely replaced the three book shelves of Greek and Hebrew books in my library. It’s easy to use interface and powerful search abilities turn what used to be an all day study into a morning of study. I have been able to reduce research and study times from 8-9 hours to 2-3 hours. The time saved has allowed me more time to bathe my study in prayer and to enjoy a more fruitful time of contemplation, and meditation upon the subject being researched. 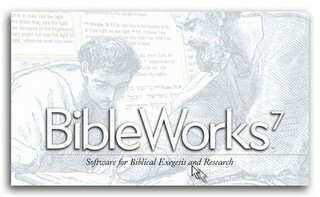 For a free color brochure describing BibleWorks 7 ,contact us. 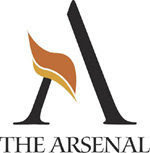 To download an electronic version of the brochure, click here (requires the free Acrobat Reader).